Let me begin this post by saying that I haven't bought every product that Glossier has to offer, just the ones that I was very interested in and figured would fit into my daily routine nicely. If you haven't read my previous reviews on these items you can go read them here and here. Today I wanted to look back at the items I've been using for the past few months and properly discuss if I would be willing to go through the trouble of repurchasing them. I am not the biggest fan of online shopping - I'll do it occasionally when I really want an item that I can't find in store, but I prefer going out to buy the item and getting it the same day. I just find it incredibly annoying having to wait a few days after the initial purchase to receive it. I'm very impatient in that regard. The items I would definitely repurchase are the Boy Brow + Haloscope Duo, the Cloud Paint in Dusk and the Lidstar, but possibly in a different colour than Fawn. I find that all these products work exactly how I expected and wanted them too - they are long lasting and pigmented without being too intense or unwearable on a daily basis. They fit into my makeup routine easily; the only thing I really had to adjust to is applying some of the products with my fingers rather than a brush, but that's been easier than I initially thought. I was especially impressed by Lidstar because I have fairly oily lids and that stuff did not budge all day! The items I probably wouldn't purchase again are the Priming Moisturizer and the Super Bounce serum. With the moisturizer I found that it wasn't very - well - moisturizing. I have skin that's on the dryer side, so I do need something a bit thicker, even in the summer months, just to give me all the necessary moisture. I found that the Priming Moisturizer was a thin sheet of cream that really didn't do too much to prime my face for make up or reduce any redness, as it claims to. However, it is a good throw-in-your-bag kind of product that I do want to finish up, but I don't think I would go out of my way to order online again. If it was available for purchase in stores I might grab another for traveling. As for the serum, while I did like the texture of it and how It made my skin feel after use, I couldn't get over it's lack of scent. I know that might sound weird in the age of scentless skin care, but the void of scent is a scent in itself. This also applies to the Priming Moisturizer - both of which smelled of the packaging they'd been in rather than something a bit nicer or more fragranced. I also found that the serum was a bit too expensive for the amount that you get. I used a dropper full every night to cover my face and it was done in a month. Imagine if I used it in the morning as well. I just think that a product like it can be made at a more affordable price. There you go! 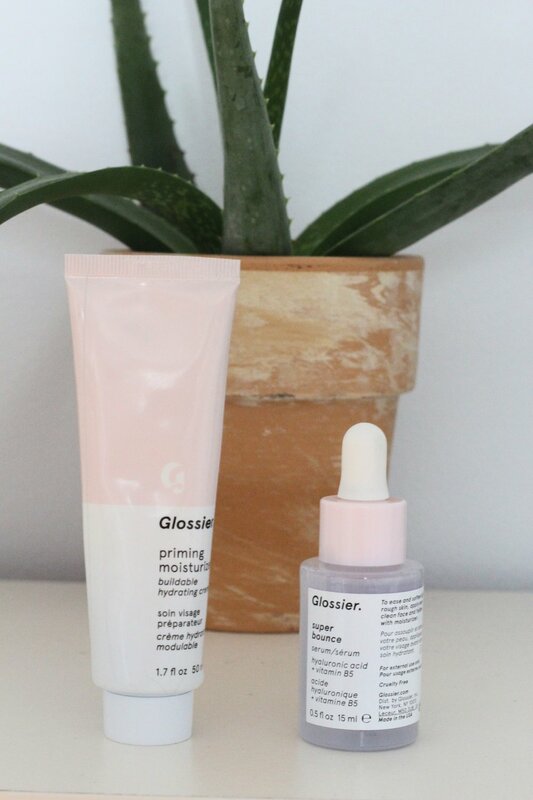 My review on the products I would and wouldn't repurchase from Glossier.